Stock or bone broth play an important role in many cultures, yet has fallen out of favour in the modern world. Chicken stock is particularly famous as a key ingredient of “Jewish Penicillin” the miracle cure-all. I also heard from an Ecuadorian friend that women would be given chicken stock at least every day for the two weeks leading up to birth and two week afterwards, such are it’s strengthening abilities. Many times here in Guatemala, I have eaten beef caldo with families, a beef stew prepared with beef on the bone. Despite what we know about the levels of malnutrition here, perhaps it is the consumption of their traditional caldo that keeps the people here strong and more healthy than we might expect. Good stock is not just beneficial for your health, the taste is amazing. When you switch from using stock cubes to your own stock, your gravies, soups and sauces will become legendary. In fact the stock is so tasty, it hardly needs any embellishment with additions. The base ingredients for the stock are mostly offcuts – bone, cartilage, tendons and whatever bits of meat they are attached to. Feet are also good, and usually a few organs make their way in there too – think giblets! This means that it is generally relatively cheap to make, you are using the “waste” from the butchers shop. It is certainly a lot cheaper than supplements. Whilst you can use a large stainless steel stock pot on the stove, I use a large slow cooker (crock pot) due to the long cooking time. Poor quality cookware especially aluminium or non-stick will contaminate your food. My slow cooker is somewhere around 7.5L (8 quart), although I don’t know for sure as I was given it by some dear friends – thank you Jesper and Danisa! I found a 6.5L one on Amazon for about £30, or about the cost of 2 bottles of glucosamine with chondroitin supplement. Stock is very simple to prepare and whilst I will give some recipes later, it is very flexible. Sometimes I have all the ingredients, sometimes I might miss one of the flavourings and add something different. It always turns out good. My staples are beef and chicken, and turkey when it is available. I have yet to try pheasant, venison or lamb due to it’s availability here. Fish stock is said to be incredibly nutritious, but between the state of the oceans here and the level of hygiene, it is also something I am yet to try. Stock takes the minimum amount of personal time to make, although it will be simmering for a long time. I generally aim for 72 hours (yes, 3 days!) for my beef stock, and at least 24 hours for my chicken stock. The biggest issue with making it is the smell. Sometimes it smells good, then it becomes overpowering. I put my slow cooker outside on the balcony, but I would imagine a garage or shed might work well too. I do not turn it off, but leave it going for the whole cook. I do occasionally add water to it, usually every 12 hours to keep the level topped up. You of course will be wanting to get the best nutrients out of your stock, and as such will need to buy good quality meat. Your base ingredients should be pasture fed and organic. Organic meat is even more important than organic vegetables. Most contaminants such as pesticides are fat soluble, and so have a greater tendency to accumulate in the fats of the animals who consume them. Whilst the fat of well raised and cared for animals may contain the richest sources of fat soluble vitamins and nutrients, the fat of factory farmed animals may contain a level of very undesirable contaminants. Whilst this is true in all cases, people in the USA in particular should be wary of any meat that is not pasture raised or wild. Factory farmed animals are the most compelling reason to turn vegetarian despite the long term health issues that a vegetarian diet may bring. If the meat is not organic, pasture fed or wild game, avoid it. Put the ribs in a roasting pan in the oven and roast at 180C (350F) for about an hour until nicely browned. While the ribs are roasting, put the marrowbones in the slow cooker and cover with water. Add the vinegar and allow to stand for 1 hour. Chop the vegetables into large pieces and add to the slow cooker. Transfer the browned rib bones into the slow cooker, then deglaze the roasting pan on the hob with a little water. Add this to the slow cooker. Top the slow cooker up with water, allowing an inch or so for expansion when the liquid heats up. Set the slow cooker in its place and turn it on to high. When the stock begins to boil, skim any foam from the surface, then add the thyme. Allow the stock to simmer for at least 24 hours, but preferably up to 72 hours. Top up the liquid level at least every 12 hours. At the desired time, turn off the heat, and strain the stock into a large pot, removing the large solids. Immerse the pot in cold water to cool the stock as quickly as possible, then transfer the pot to the fridge to chill fully. Skim the solidified, floating fat from the stock and transfer into storage containers. I generally freeze my stock in ziplock bags, allowing 1 cup (250ml) per bag. To do this put the bags in old yoghurt pots during the freezing process to avoid spillage. The frozen stock seems to last a long time, in our house it gets used very quickly. The fat is very useful for cooking, although it may need to be rendered. to do this, put it in a pan and heat it until it starts to spit – this is the water boiling out. When the fat has clarified and is no longer spitting, allow it to cool, transfer it to a glass jar and refrigerate. It is a wonderful and nutritious fat to cook with, particularly for making roast potatoes. Once you have tried roast potatoes made with beef fat, you will be making stock just to make sure you have enough fat available! Our dogs love the bones and vegetables from the stock. Whilst roasted bones may be hard and splinter, the boiled bones are remarkably soft. Of course you will need to check this with what you produce to avoid harming your animals. This same recipe can be used with lamb or venison. Cut the chicken into pieces. Remove the legs and wings, and chop through the bones exposing their interior. Cut the carcass into about 8 pieces, making sure you cut through the breast bone and spine. Cut the neck into several pieces. Put the chicken pieces into your slow cooker. Add the giblets, feet and head. Coarsely chop the vegetable and add them to the slow cooker. Cover with water and add the vinegar. Allow to stand for 1/2 hour. Add enough water to fill the slow cooker, allowing enough room for expansion of the liquid as it gets hot. Move the slow cooker to the place where you want to make the stock. Turn on the power and set to high. Bring the stock to a boil. Skim off any foam that rises, then add the thyme. Allow the stock to simmer for at least 12 hours, and up to 24 hours. Top up the liquid level as necessary. You will find that the meat from the chicken will be very easy to separate from the bones. This is ideal for making curries, stews or pies. It does not have a great deal of flavour, most of the flavour ended up in the stock, so it is not great for sandwiches. I do not use the chicken fat recovered from the stock making, this goes to our dogs along with the bones and vegetables. Once again, the boiled bones are softened, and do not seem to cause a problem to our animals, but check this for yourself. This recipe can also be used with turkey, pheasant, duck or goose. If you make duck or goose stock, be sure to save the fat from the process as it is highly prized! In our not-to-distant past, every region would have their specialities. From sauerkraut, to kvass, to ginger beer, to pickles, to ketchup, seasonal fruits and vegetables were preserved using natural means for later consumption. Rather than negating their nutritional value, as most modern preservation methods do, these ancient methods enhance and enrich the foods. Essential nutrients were sometimes made more bio-available by the simple action of a few bugs and digestibility of some foodstuffs was enhanced. It is estimated that only 10% of the cells which make up your body are human, the rest are micro-organisms (mostly bacteria and fungi) that form a symbiotic relationship with your body. This is known as the human biome. As such it may be more accurate to imagine your body as a ship and the micro-organisms as the crew. The crew carry out specific functions, such as aiding digestion, creating vitamins and many other duties. Most importantly, they help to fight off invaders. It is estimated that 70% of the immune system is based in the gut. Without the crew, the ship would begin to fall apart. If the crew are not well looked after they may become inefficient at their jobs, or they even start to mutiny and turn on the body causing auto-immune disorders. We can keep the crew happy by keeping them well fed and looked after and in turn, the happy crew carry out their duties. An unhappy, underfed crew create a tension within. This could be seen as a release of chemical signals within our bodies which can trigger cravings or allergies, although there is another possibility. If we consider that every living organism has a bio-energetic field that interacts with the bio-energetic fields of it’s neighbours, we may start to get another idea about cravings. What we have observed with candida albicans overgrowth is cravings for those things that feed the bugs, i.e. sugars and carbohydrates. We say that the bugs are doing the thinking. I don’t doubt that they are causing some biochemical imbalance which also leads to cravings, but when you realise that your crew makes up 90% of you, it must be impossible for the captain (your mind) not to hear them! Introducing fermented foods and beverages into your diet can be one of the easiest steps towards feeling good, both physically and mentally. It doesn’t take up much time and it doesn’t cost much. You probably have most of the equipment and ingredients around already, although I have to warn you that you may become a jar hoarder once you develop a taste for fermentation! You get to play, you get to create taste sensations and you start to realise that what you always thought was the premium product is actually a pale shadow of the real thing. This happened to me with mayonnaise. I had a fierce loyalty towards Hellmann’s Mayonnaise (especially on turkey sandwiches!) I had tried other mayonnaise, but it just didn’t measure up to Hellmann’s. Then I moved to Guatemala. It was different here, the premium products were from the US. Things tasted weird, and not in a good way, even the Hellmann’s mayonnaise. The ketchup was made using high fructose corn syrup rather than sugar and was way too sweet. My first reaction was to just stop buying those products, which was probably a pretty good thing. Then nostalgia set in, I started to want things I could not find in the stores. I wanted Heinz baked beans and Marmite, so I turned to the internet and found that I was not alone. Other people had already been experimenting, making their own versions of their favourites. The baked beans were pretty easy, and proved rather popular amongst the British ex-pats here, the Marmite is to date one of my most complicated and unusual projects. Getting back to the mayonnaise, when I received my copy of Nourishing Traditions, I started to understand what condiments really were, what their original purpose was. We use modern, store bought condiments as flavour enhancers, to brighten up foods, and often to get a sugar hit to feed our sugar addictions. These sauces and pickles have been redesigned from their origins. Mass produced condiments use sugar and vinegar to extend shelf life and create conformity. 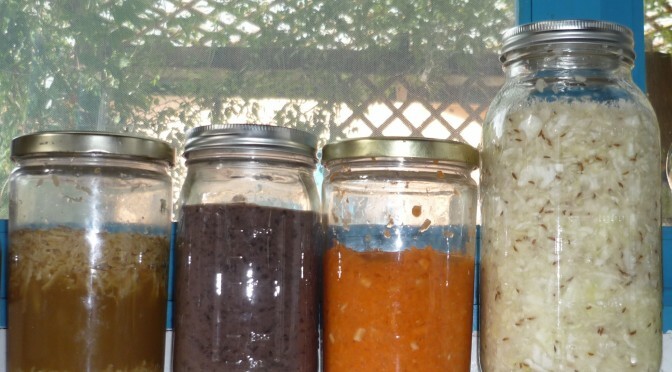 Naturally fermented, probiotic condiments help you to digest your food and bolster your own biome. It is like taking a shot of tasty medicine with your meal. When I learnt how easy it is to make REAL mayonnaise, that is every bit as thick and creamy as the store bought version, but is laced with probiotic bacteria, I never looked at a store bought version again. I’ll share the recipe with you shortly. Many of the recipes in Nourishing Traditions call for whey. This was something I had seen as an ingredient on packets, but never seen in real life. I use it in my recipes too, usually, although some changes in the milk here have caused me to try whey free versions, which also worked. I do recognise that some people who read this may want to work with dairy free versions. But whey, where does it come from, how do get hold of some? The answer is far easier than you may expect. Whey is that liquid that you find floating on the top of good quality yoghurt. It is yellowy green and slightly viscous, it often reminds me of diesel! One litre of yoghurt will usually yield about half a litre of whey. If you are in a rush to get started you could buy a litre of good quality live yoghurt, otherwise you can make your yoghurt, which can work out a lot cheaper. It is so easy, once you start you will wonder why you ever bought yoghurt. Of course the best quality of ingredients you can get will give you the most nutritions product, but do the best you can. If you live somewhere that you can get hold of organic, raw milk from pasture fed cows, you have hit the jackpot. However, most of us have to make do with store bought, pasteurised milk. For your first experiment at least try to find organic whole milk, if possible not homogenised. The yoghurt starter should also be the best quality you can find, such as Rachel’s or Yeo Valley in the UK. Make sure that the only ingredients are milk and yoghurt cultures. If there is anything else on the label, choose another brand. Materials: Saucepan, 1 litre clean glass jar, thermometer (optional), cooler/ice chest/ cardboard box with a blanket or towel. Take the original yoghurt culture out of the fridge and put two tablespoons into a 1 litre glass jar, this will allow the bugs to come up to room temperature and get active. For store milk: Heat the milk in a saucepan to about 90C (180F) if you have a thermometer. If you don’t have a thermometer, this is the point where the skin just starts to form on the milk with a few bubbles under it. Turn off the heat and allow the milk to cool to 45C (110F). This should be about the temperature of a pleasantly warm bath. Pour the milk into the jar with the yoghurt starter and stir well with a wooden spoon. Put the lid on the jar and put the jar in a warm place. I am fortunate in that I live in a place warm enough that I can make yoghurt without too much difficulty. If you have an airing cupboard, this might be a great option for keeping your yoghurt warm. I have also used an oven which has been turned off and allowed to cool down. Another option is to put a couple of bottles of warm water in an ice box or cardboard box. Wrap a blanket or towel around your yoghurt jar to keep it away from extremes of temperature, then leave it alone. For some reason, yoghurt bugs don’t seem to respond well to being moved around. After 8 – 12 hours you will have your first batch of yoghurt. It should look thick, almost solid and you may see the whey floating on top. You can now store it in the fridge. The yoghurt will continue to slowly ferment in the fridge, and should not really go bad, although it will get increasingly sour as more lactose is turned to lactic acid. Always remember to keep a couple of tablespoons of your yoghurt as a starter for the next batch. So now you can get to making your whey. This is a very easy process that has a rather tasty by product – cream cheese! Line the strainer with cheesecloth or paper towel and place over the bowl, then pour your yoghurt into the cheesecloth. I put a plate on top of the strainer and then a tea towel over the plate to stop flies getting in. The whey will collect in the bowl. Once it has stopped dripping (12-24 hours), the cream cheese is ready. Put the whey in a glass bottle and store in the fridge. the cream cheese should separate out of the cheesecloth / paper towel quite easily. I like to add chopped walnuts, herbs, garlic and salt to the cream cheese, then store it in the refrigerator. In the next post we will be using the whey as a starter in lacto-fermented foods. A few years ago I started to get much more involved with food. I have always liked to make “proper” food. True, I did enjoy takeaway food from time to time, but I also enjoyed making Sunday roast dinners too. I wasn’t really in to preprepared foods, although I did use them when I was younger. Then, in June of 2004, I was asked to help look after my brother, who was very ill. When he was first diagnosed, we specifically asked if there was any particular foods that he should eat or avoid. We were told that it was important that he should keep his spirits up, so we should get him whatever he would like to eat. We were also told that the food served in the hospital was basically a filler with little nutritional value, to stop people from being hungry. Chemotherapy had twice failed to deal with his cancer, and he had decided to try an alternative route. We went for an appointment in Northern England with a woman who carried out some Kinesiology testing and gave him a program of dietary changes, detoxing treatments and therapies to follow. I was drafted in to help him, as at the time I was about the only one who had set food in a health food shop, although I have to admit I was probably only one step ahead of the rest of my family. The dietary changes suggested for him were pretty radical for us to comprehend and work with. There were names of things we could hardly pronounce, let alone have any idea of where to get hold of them. It turned out that these things were actually not that mysterious, they were actually available in local supermarkets, they were just in the aisles we never looked down. So I started to learn about sprouting and juicing, about organic food, about supplements, different ways of preparation of foods. It seemed that the dietary advice he had been given had partly been based on the book “Eat Right for Your Type”, so we ordered a copy of that. I also came across a book that I would strongly recommend, Paul Pitchford’s “Healing with Whole Foods.” I learnt so much then, and none of it corresponded with that first advice from the well meaning, but misguided, medical staff. It turned out that those crayfish and rocket sandwiches my brother had been so fond of probably were not the thing he needed to help him recover, even if they were tasty. We set to work with our new found ingredients, and with the juicer, making new things for my brother to try. I remember vividly the look on his face after drinking his first green juice! We set about a wholesale change of his diet (along with a program of Reiki and yoga) and for the two weeks we watched his energy coming back, we watched him getting better. I don’t know what would have happened if we could have continued solely with that route. About 2 weeks in to his new program he got a phone call, the specialists had come across a potential treatment for him in the shape of an experimental type of chemotherapy. It is very difficult to revitalise a body already weakened by an aggressive disease and chemotherapy, even more so when it is still being poisoned by more chemotherapy. Sadly, he never recovered from his illness. Of course this had a huge impact on me, but what is more is that what I had learned could not now be unlearned. Partly through my new understandings, I started to modify the way I was eating. Now, 11 years later I can see how far I have come, although I realise there is so much more to learn and try. Every book or article I read gives me a little something more, another little piece. Some books give far more of their fair share to my understanding. They share a common root, the work of Dr Weston A Price, a dentist who travelled the world in the 1930’s examining the health of remote communities. These included Swiss, Irish, Scottish, Bulgarian, African, Asian and Eskimo communities eating their traditional foods. What he found was that they were generally in excellent health with very few caries. They were strong, attractive and had healthy children. They were eating their traditional diets, which consisted of meats, fats, vegetables and a little carbohydrate. Their foods were minimally processed, fresh and raw. Another common trait was the consumption of lacto-fermented foods, whether it was dairy products, vegetables, meats or grains, each of these populations had their specific ways of preserving and enriching their foods. He compared these remote communities with their peers, living close to ports and eating modern processed foods and found that their “civilised” peers had huge levels of tooth decay, degenerative diseases, crooked teeth, deformed bone structure and infertility. In fact, it seems that much of what he observed with regards to the diets of the “uncivilised” people was in direct opposition to what I understood as healthy eating, particularly when it came to animal fats, but that I will cover in another post. My first introduction to Dr Weston Price’s work was a book called Nourishing Traditions. Nadia suggested we got hold of a copy as she thought it might interest me. things started to make sense, and while I don’t necessarily agree with everything in the book, it is a fantastic starting point. It has both articles and recipes, and shows how to make many of these ancestral elixirs. Within weeks our kitchen was transformed into my laboratory, where jars of strange looking foods bubbles and changed of their own accord. Some processes took a long time, but the actual work involved was relatively minimal, especially after I got myself a food processor. Making precursors, multistep processes, it ended up like having a whole bunch of new pets, although these pets were microscopic lactobacilli, fungi and yeasts. These tiny creatures were doing most of the work for me, enriching our food, while I kept my part of the bargain and ensured they had a constant supply of nutrients. I was very new to this, it was not anything that was in my family tradition. I had NEVER eaten sauerkraut before I made my own, mostly because I avoided pickles due to my aversion to vinegar. I always thought that special equipment was needed to make yoghurt, having seen a friend’s mum’s yoghurt maker machine in the 70’s. These were all things which were so far out of my life experience, I never imagined the richness I was missing out on. I continued to work through the book making various strange brews, most were tasty, and only one went directly down the drain! My sauerkraut became rather popular and was even bought by some of my German friends here, something I felt rather proud of. My ginger beer was also well liked. I became more and more interested in the nutrition side of things until I decided to enrol on a diploma course in holistic nutrition, although once again I was disappointed to see some of the same advice given on what is considered to be healthy eating. Additionally, I also was interested in more natural ways of making things around the home. Most of the products in the shops here contain ingredients I don’t want around my home. I often find that standards of products from the USA are much lower than Europe, and of course Central America tends to manage to step below the US. While I was looking for inspiration on soap making, I came across the Wellness Mama site, which is a very inspirational site, packed full of interesting stuff. While I was on there I happened to find a review of another book which has become a big influence on me – Deep Nutrition by Dr Catherine Shanahan. The book goes into detail about our need for traditional foods, and actually gave me the inspiration for the name of my web domain. “Dr Cate” as she is known, cites Four Pillars of successful traditional cuisine. These are: meat on the bone, fermented and sprouted foods, organ meat, and “fresh, unadulterated plant and animal products”. She goes into detail with regards to how natural foods nourish us at a genetic level, and how the allergies and diseases we are seeing appear now are not just because of the choices of our generation, but those of our grandparents. For me one of the most interesting points that she makes is that our food is information about the state of the soil it is grown in. Several years ago, my dad, who is close to the farming community, told me that the soil in the fields of England was little more than a medium to support the root structure of the plants. It was pretty much devoid of nutrients, and only the artificial fertilisers being put onto those fields was growing the crops. Combine this with many other modern farming practices and of course the food that we make with those crops is coming up short of the mark. However, all is not lost. The human body is a truly remarkable things and thankfully we can recuperate, we can regenerate, we can rebuild. We can nurture our bodies, we can detoxify the years of abuse and replenish our vitality. I am working towards making things right , but I still have a way to go. I am by no means anywhere near perfect. Yet again, this is a journey for me, and I have taken the first few steps along the path. I am excited about sharing my discoveries in these steps.